October 18, 1937: Kids on the lot. Judy is mentioned in this interesting article about MGM’s (now fabled) schoolhouse. October 18, 1939: Babes in Arms took the country by storm, not just on this day but through the weekend and beyond as it opened in theaters around the country. It was a hit with audiences and the critics making MGM quite happy. 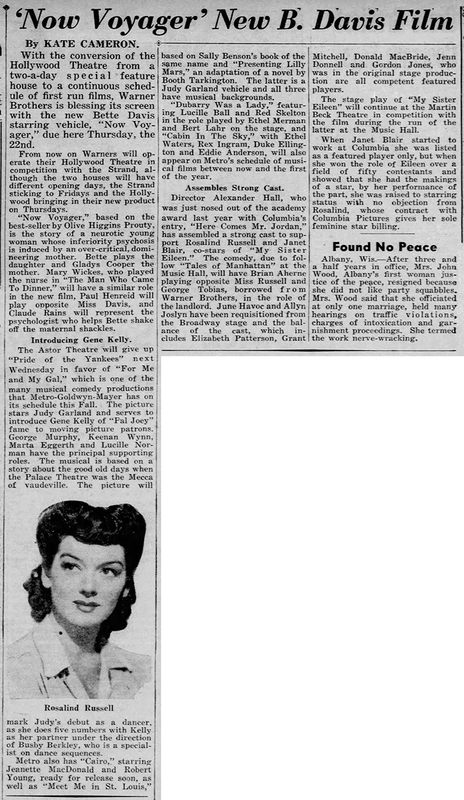 October 18, 1939: In the curio department we have this article about Judy’s grandmother visiting one of her seven children in Wilmington, Delaware. 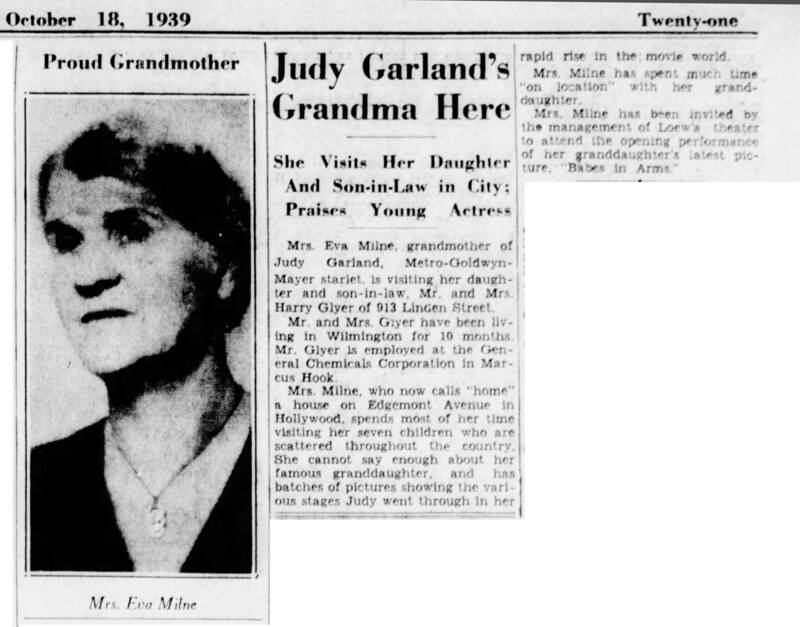 “Milne” was Judy’s mom, Ethel’s, maiden name. 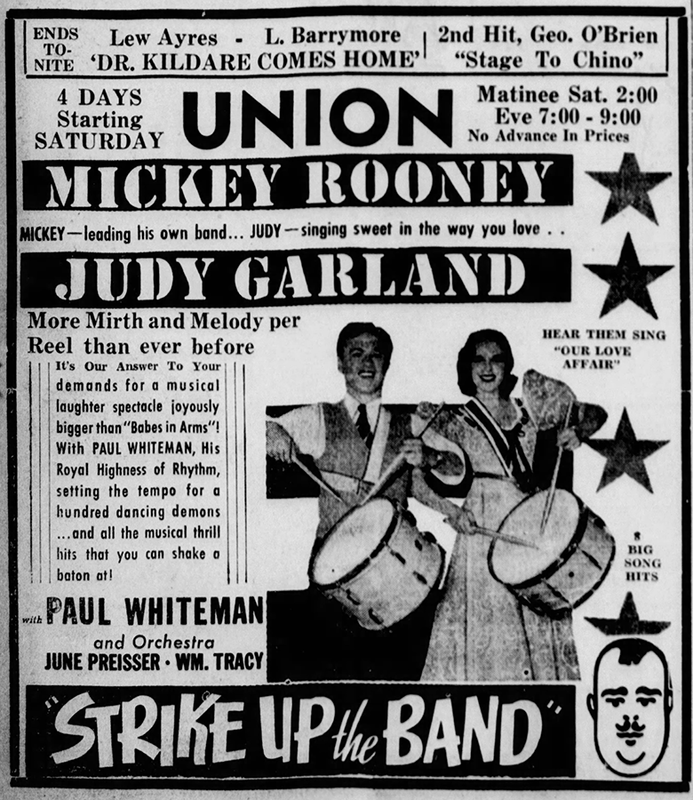 October 18, 1940: Still enjoying great business and box office, Strike Up The Band. 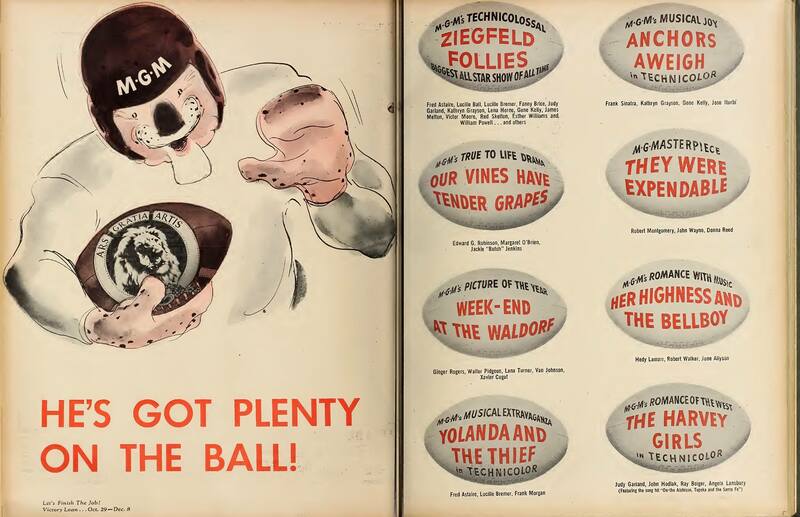 October 18, 1942: A few items. 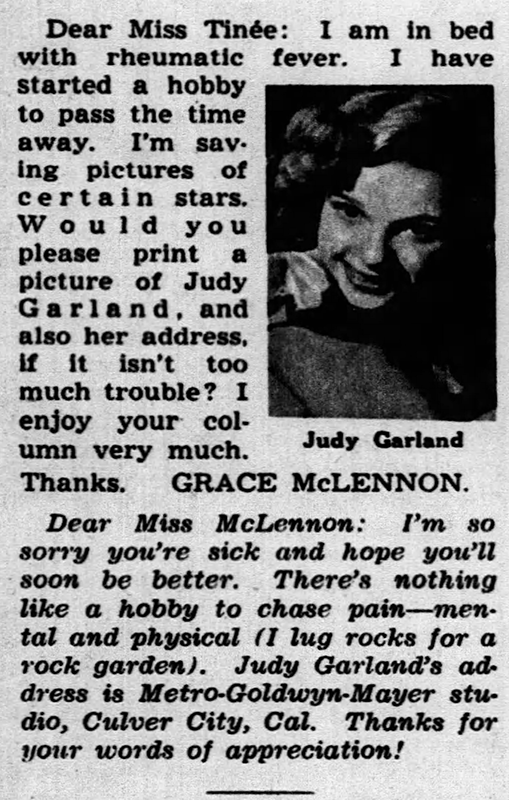 First, is an early mention of Meet Me In St. Louis as an upcoming MGM project although Judy’s name wasn’t yet attached. It was attached to Presenting Lily Mars. 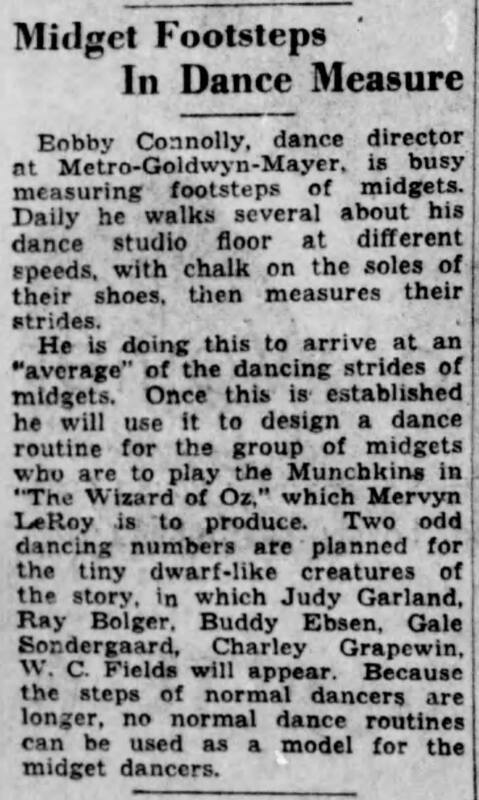 Also in the article also reports on the newcomer Gene Kelly and Judy’s debut as a dancer in the upcoming release of For Me And My Gal. The second article is about For Me And My Gal and how it’s Judy’s first real grown-up role. The ultimately deleted “The Spell of the Waltz” as performed by Marta Eggert is also mentioned. The last is Chicago’s “Voice Of The Movie Fan” column. A reader asks for a photo of Judy and her mailing address which will help a lady with rheumatic fever pass the time while convalescing. October 18, 1944: Filming on The Clock continued with scenes shot on the “Interior Lobby Medical Building” set. 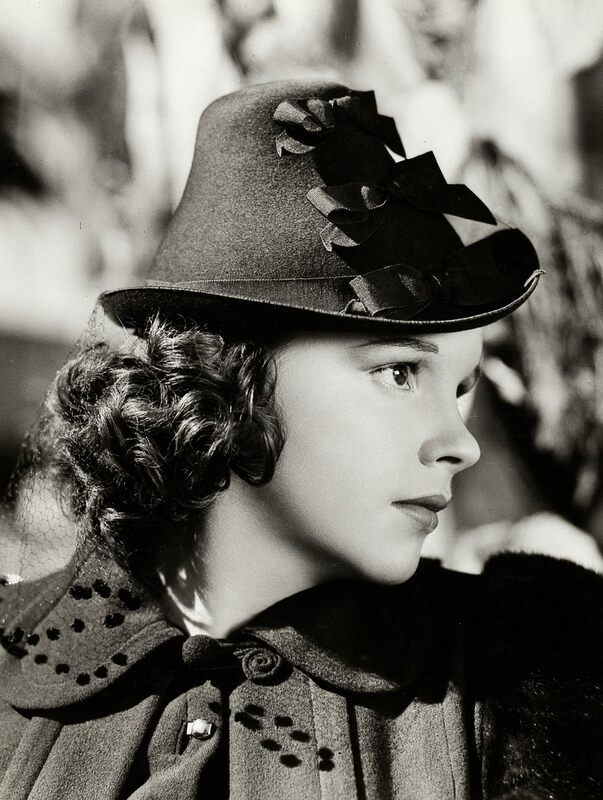 time called: 10 a.m.; dismissed: 5:50 p.m.
October 18, 1945: Judy had a wardrobe fitting for Till The Clouds Roll By from 1:45 to 2:40 p.m. She then had rehearsals on the “Who?” number from 2:40 to 3:35 p.m.
October 18, 1945: MGM ran this two-page ad promoting The Harvey Girls and Ziegfeld Follies (among other films) in the Film Daily trade paper. 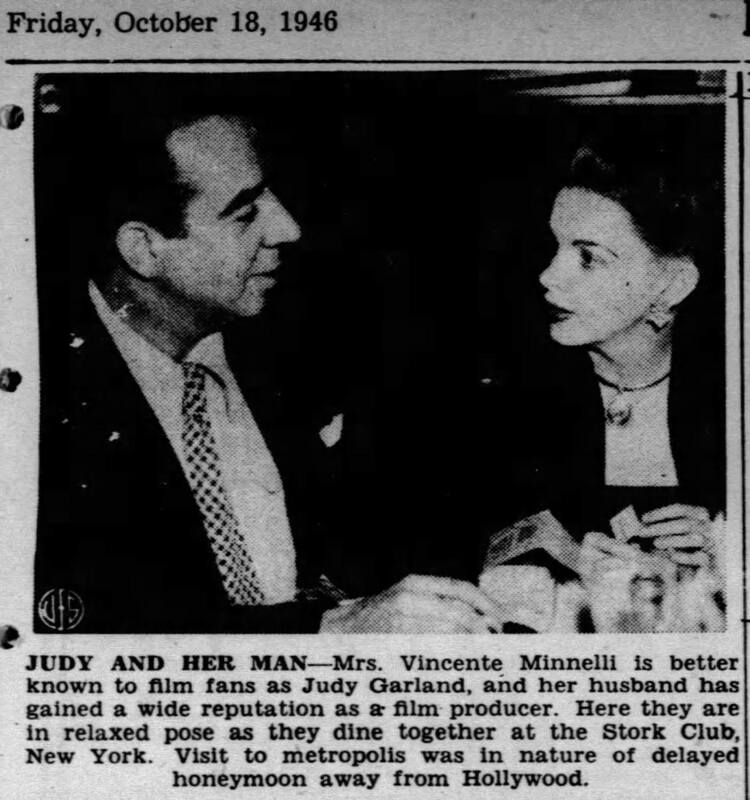 October 18, 1946: This photo of Judy with new husband Vincente Minnelli appeared in various papers around the country. They’re seen at The Stork Club, which was a favorite of Judy’s as she was photographed at the club many times over the years. Download the out of print CD here (zip file) here. 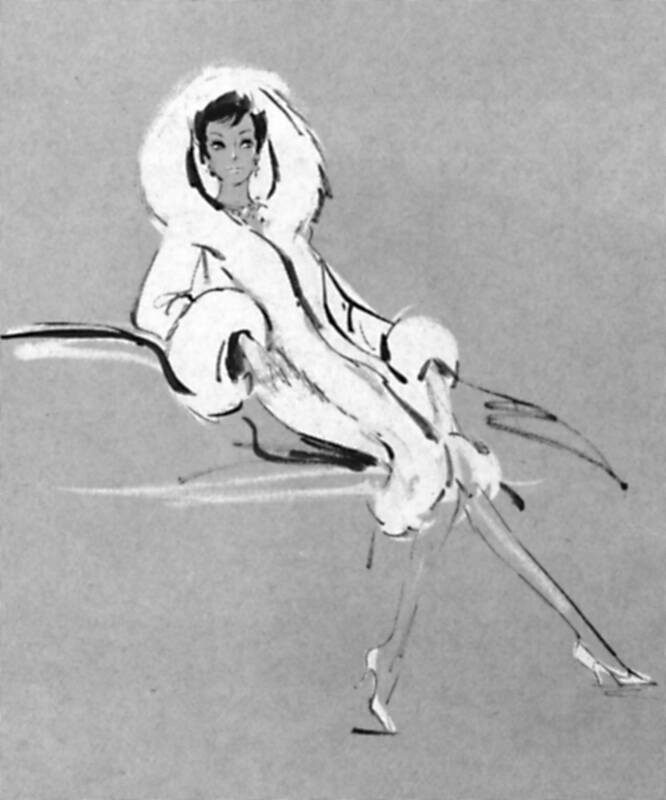 October 18, 1963: This costume sketch for “The Judy Garland Show” is dated this date. October 18, 1963: The videotaping of both the dress rehearsal (from 5:30 to 7 p.m.) and the final performance (from 9 p.m. to 10:30 p.m.) of “Episode Eleven” of “The Judy Garland Show” at CBS Television City, Stage 43, Hollywood. Judy also taped a “Tea For Two” segment with Allen’s wife, actress Jayne Meadows. The show was intended as the first to air in the New Year, being televised on January 5, 1964. 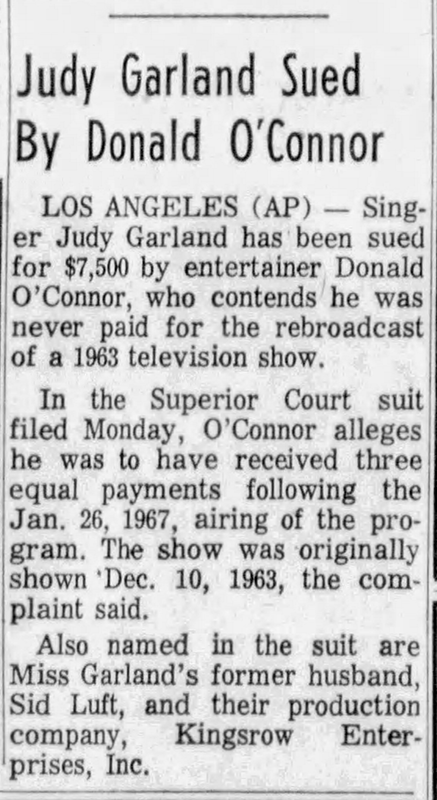 October 18, 1963: Columnist Dorothy Killgallen reported in her column that Jack Jones was going to replace Jerry Van Dyke as Judy’s sidekick on her TV series. That didn’t happen. 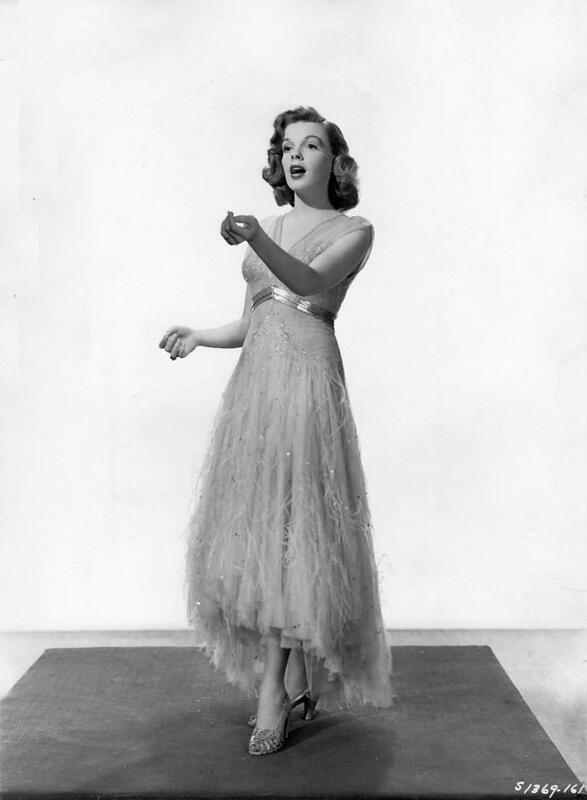 Killgallen noted that Judy shouldn’t need to be funny and that the show should let her concentrate on what she did best – sing. She also noted that the show was getting better each week. 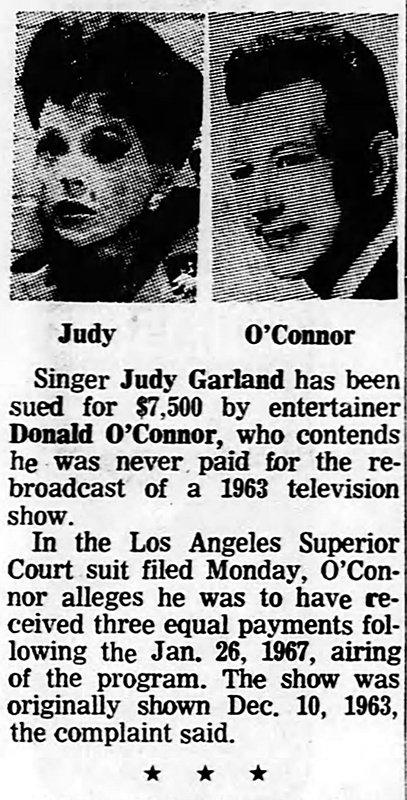 October 18, 1967: The news hit the papers that Judy’s friend Donald O’Connor was suing her, Sid Luft, and their production company, Kingsrow Enterprises, Inc., for nonpayment of his appearance on Judy’s show in 1963.